I am not very good when it comes to skin care, you can tell just by looking at the condition of my face. In the past few years I have tried products but haven't really stuck with them. Some have worked and others, well not so much. So when I read a little bit about The Skin Regime I was intrigued. I didn't expect to learn so much. I couldn't put this little book of information down! 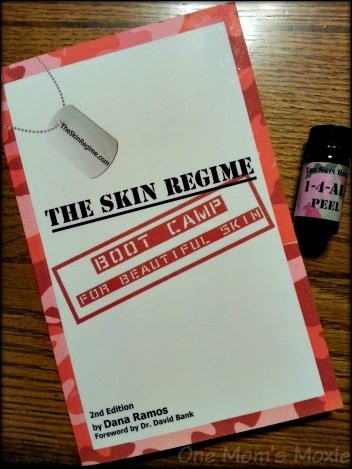 The book's author Dana Ramos was generous enough to send me her book, The Skin Regime: Boot Camp for Beautiful Skin and The Skin Regime 1-4-All Peel. Once I started reading about how to take care of skin, I was amazed. This book is one little gem, so much insight about skin and the products to use and what to avoid. Like I said before I really didn't take good care of my skin, as a teenager and in my 20's I didn't do much except for the occasional moisturizer and a home mud mask. In my late 20's I noticed a change. 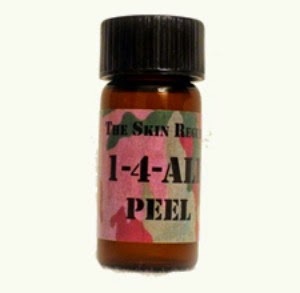 My face started to breakout, it was dry and oily, uneven tone, and then the dark spots came. This is when I decided to start trying various products, but I needed something that was simple. This book shares a way to do just this, a simple skin regime that anyone can do. I haven't finished my 10-12 weeks of using The Skin Regime just yet. This amount of time may seem long, but the change doesn't happen overnight (like we all wished it would). But I still plan on sharing once I finish. I am telling you all do not hesitate in purchasing this book. You will be pleasantly surprised. There isn't a certain product being pushed on you, everything is explained, sometimes with a bit of humor that makes you smile. Lastly, I want to share one tidbit of info that I had never heard of before. Within the last year or so I started to have this blotchy light brown coloring near my cheekbones and one BIG almost circular spot in the middle of my forehead. While reading about Dana's own skin story she shared that she had this same experience. The discoloration is called melasma. I couldn't believe what I was reading, I had never known anyone else to have the same thing. Especially when she mentioned it being on her forehead, I have been so embarrassed about this. So I thank you Dana Ramos for sharing this, it opened my eyes and made me realize I am not alone. 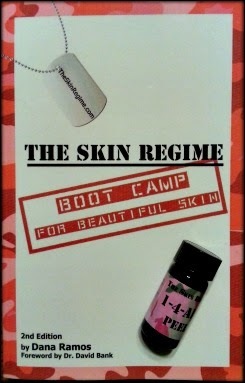 I love the book, The Skin Regime: Boot Camp for Beautiful Skin, and the 1-4-All Peel, and I believe you all will too.